City NewsWho Will Save the Skyline of Paris? Who Will Save the Skyline of Paris? Who will save the skyline of Paris? Is Paris for sale to the highest bidder? Nicolas Sarkozy, the President of France and Bertrand Delanoë, the Mayor of Paris, are planning massive new towers that could destroy the character of the beloved city, says Mary Campbell Gallagher, J.D., Ph.D. Note. 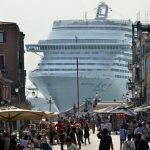 This article by Mary Campbell Gallagher appeared on Planetizen.com on November 29, 2010. One of the towers she mentions is now under construction and already visible from the center of Paris. It is the Renzo Piano courthouse in the 17th arrondissement. Photo above: Jan Wyers. Today Paris may be the world’s most beautiful city. Looking across its harmonious jumble of low rooftops to the distant Paris sky shimmering pink and blue, Paris melts the heart. The filigreed density of Paris enchants — grand royal buildings with interior gardens, apartment houses with courtyards glimpsed through latticed iron gates, the Seine crossing the city, the boulevards penetrating the old neighborhoods and crossed in turn by narrow alleys, the churches cradling dark interiors, and outside, busy street life flowing along the tightly-built streets under the beautiful Paris sky. But perfection invites destruction. Mr. Sarkozy’s Grand Paris project, as approved by the French Senate this spring, includes building new Métro lines, which Paris has long needed. It also provides for massive changes that do not immediately affect the skyline, including building new centers of economic activity around Paris, and relocating academic institutions from Paris to a nearby area called Saclay. But Mr. Sarkozy has also announced that Grand Paris means that France must build towers in and around traditional Paris. For the skyline of Paris towers are a radical departure. Paris has had some sort of height limits for hundreds of years. But in July of 2008, desiring towers at least as much as Mr. Sarkozy, the Socialist-dominated Paris City Council raised many limits. Instead of 31 meters (roughly 102 feet) in the center of the city and 37 meters (roughly 121 feet) on the periphery, the limit for housing on the periphery became 50 meters (164 feet). The Council also approved six tower projects, including its very own first skyscraper. The shiny 50-story, 211-meter, 692-foot, glass “Projet Triangle” by Pritzker-prize winners Herzog and de Meuron will loom over the six- and eight-story buildings of Paris in the 15th arrondissement. It will contain offices, a conference centre and a 400-bedroom hotel as well as restaurants and cafés, and will be smack in the line of sight of the 81-story, 324-meter, 1063-foot, Eiffel Tower. But think of the views for the corporate tenants! Think of the money! 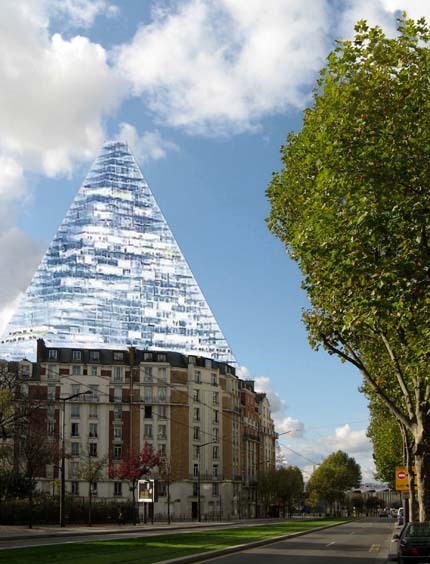 The preservationist organization SOS Paris has published a photomontage by Bernard Gazet that suggests how Projet Triangle will intrude into the horizon. Image courtesy of SOS Paris. 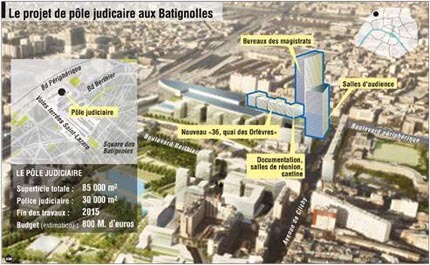 The City Council’s second project will be a 20-story, 150-meter, 492-foot, courthouse tower, set in a green space, as towers so often are, in a massive development of offices, lodgings, and schools, that will replace railyards at Clichy-Batignolles in the 17th arrondissement. Christian de Portzamparc and Renzo Piano are in competition to design the tower. Hello to long dull walks between buildings. Good-bye to the solid street fronts with little shops that make traditional Paris so fascinating and walkable. How ironic. While smart growth advocates in Berkeley and elsewhere in the United States hold up Paris as an urban model for their downtowns, the Mayor and City Council of Paris thumb their noses at exactly the features that make Paris smart. Image courtesy of the MoDem political party. Nor does the damage stop with Projet Triangle or the courthouse. The City Council has another four tower projects in view, and the Socialist majority just this month amended the city’s official planning document to include towers in one of those areas, the 13th arrondissement. As these politicians’ confidence in throwing over Parisian traditions may suggest, architecture in France today is a rigid monoculture of modernist theory. It demands towers and allows no contrary views. This is despite the fact that every modernist tower ever built in Paris has been not just a failure, but blight — most famously, the Tour Montparnasse. Architects committed to tall buildings that will affect the skyline of Paris are also in charge of planning for Paris neighborhoods. Yves Lion directs planning for Massena in the 13th arrondissement. Rogers Stirk Harbour, Jean Nouvel, and others, direct planning for Bercy in the 12th, and the adjacent suburb Charenton. The modernist grip is so rigid that there are no active traditional architects in France to compare with Allan Greenberg, Robert A.M.Stern, the Institute of Classical Architecture & Classical America (ICA&CA) and many others in the United States, nor planners like the New Urbanists in the U.S., nor traditional architects like Quinlan Terry and Robert Adam in England. Nor is there any independent person in France speaking out on behalf of the city’s residents, arguing for planning that respects the scale of the city’s buildings, and respects history, as Prince Charles and his organization the Prince’s Foundation for the Built Environment do in the U.K.
Old and new in the 13th. Image courtesy of Flickr user hotels-paris-rive-gauche. French politicians are said to be guardians of their heritage. What would make them surround exquisite central Paris with banal towers? Could money be the answer? Developers and corporations that want to build towers can pay high prices for land and high taxes. So why not sell them Paris? Mr. Sarkozy and Mr. Delanoë both say frankly that they want towers so Paris can compete with London and Dubai as a center for international business. The race to be a business center is a race to build towers. The Burj Khalifa, just opened in Dubai, at 2,717 feet, is for now the world’s tallest man-made structure. Meanwhile, another reason to build towers in Paris, for social housing, comes from the need to deal with the unassimilated Muslim populations in the suburban projects, with their high unemployment and crime rates. To be fair, France suffers from the same economic challenges as other industrial countries. Factories are closing, the population is aging, Europe is in recession, and social service costs are up. Mr. Sarkozy’s raising the retirement age has caused massive strikes. Building towers in Paris feels like selling the family jewels. Along with Rome and Washington, D.C., Paris is one of the world’s few remaining cities with a traditional skyline. It glories in its low horizon, its beautiful sky, the lively crowds on its tightly-built blocks. Why fight success? The burden should be on those who want to break with 2,000 years of history. The argument for office towers inside Paris does not meet that burden. 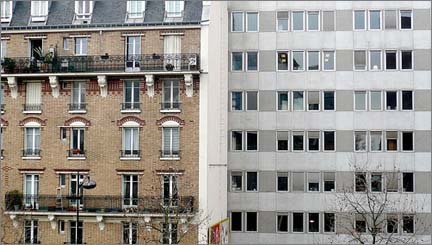 Offices are already provided for, after all, in low buildings inside Paris. They are also provided for at LaDéfense, the corporate suburb whose towers poke up behind the Arc de Triomphe. Nor can politicians and developers hope to exploit and preserve Paris at the same time. Polls show Parisians unequivocally rejecting towers, by 55-60% or more. Politicians can’t very well argue that making rich developers even richer or fattening government coffers are good reasons to destroy the horizon that Parisians love so much. Mayor Delanoë tries to distract residents by arguing that Paris needs more housing for young families. Unfortunately for this sentimental diversion, towers cannot actually pack more families into Paris than traditional Paris buildings can. 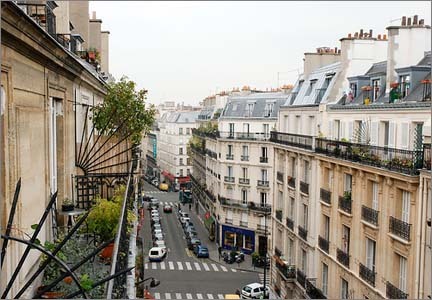 With its built-up blocks of six and eight-story traditional buildings, Paris is already five times denser than London. In fact, it is denser even than Mumbai. If traditional Paris buildings are so dense, and if there is space somewhere in Paris to build, then traditional Parisian buildings are obviously the way to house more young families. And in fact, as images showing the program for the 17th arrondissement demonstrate, any time people plan for towers, they also spread buildings apart and plant grass in between, and they widen the streets if they can. Thus, if Paris bows to the developers and builds towers for lodging, it will wind up housing fewer young families with children, not more. The Mayor’s argument is specious. Image courtesy of Flickr user darrel ronald. Another rhetorical distraction from the money-seeking of the developers and politicians is the attempt to substitute pride in French technology for Parisians’ attachment to livability, heritage, and beauty. President Sarkozy asserts that the Paris of 2030, with towers, will be a green post-Kyoto city. Mayor Delanoë concurs with the principle of sustainability. This is nonsense. No matter how many solar panels French engineers paste on tall buildings, they will still not be green. Indeed, the Green Party in Paris argues persuasively that tall buildings made of concrete and steel are intrinsically energy-gobblers, and that energy-efficiency and tall buildings are totally incompatible. Experts like Michael Mehaffy, managing director of the Sustasis Foundation in Portland, Oregon, agree. Buildings cannot be tall and green at the same time. Above six stories, green quickly turns to grey. The skyline of Paris is the loser, along with the environment. Mr. Sarkozy launched his Grand Paris project in 2007, early in his presidency. In 2008 he announced that 10 world-renowned architects would choose teams of experts and help re-imagine the Paris of 2030. He said that those architects were uncompromising in demanding towers. The 10 government-subsidized teams, with planners, artists, geographers, and others, did their preliminary work. They made futuristic proposals and put on a gigantic exhibition at the Cité de l’Architecture et du Patrimoine in Paris that ended in November 2009. And they generally mystified Parisians. This month they proposed an alternative route for the new Métro. The practical results are close to nil. But the French do love the idea of the new. “Paris is on the move!” Anne Hidalgo, the Deputy Mayor, told The Times of London. Mystifying or not, unless someone stops them now, international starchitects and their developer and corporate patrons will succeed in vandalizing the horizon of Paris. Gripping politicians’ imaginations and developers’ checkbooks, the architects unceasingly demand towers. The towers they picture will of course be the personal statements of the architects. They will be foreground buildings, rather than the background buildings that might contribute to the city’s glorious ensemble. Wielding a theory in which architecture must express history, the Starchitects sob that without towers, Paris will become another museum city like Venice. What a fraud! Dynamic Paris is changing all the time, positively vibrating within its height limits. The argument that it might become a museum if architects don’t get to build their towers is a self-serving phantasm built on an absurd theory. It is pure public relations hype. Our fears for the skyline of Paris, on the other hand, are real. The developers who want to lift the height limits in Washington, D.C., will have a hard time, because that would take an Act of Congress. But in Paris, the City Council has already changed the law, and building permits are being issued for towers. Paris needs to hear international outrage. Aux armes, citoyens! Sound the alarm, SOS Paris! Let us found the American Friends of the Paris Horizon!